Hyatt House Atlanta/Downtown is a 7-story building with 150 upscale rooms 102 of which are spacious suites. The hotel is a block away from Georgia Aquarium and ideally located near attractions such as the Centennial Olympic Park, CNN Center and The World of Coca-Cola. 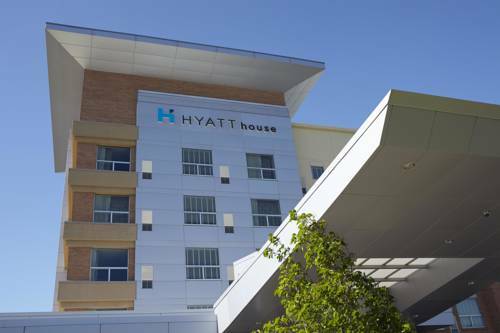 The Hyatt House was designed with features found in modern homes and apartments combined with architectural details offering a variety of guestroom types makes the hotel perfect for business and leisure travelers. During your stay, you will enjoy a complimentary hot breakfast and high-speed internet. The outdoor pool, fire place and fitness center will provide relaxation and a healthy lifestyle while away from home, and our knowledgeable Front Desk associates are available 24 hours a day to assist with your requests. In addition, the H BAR welcomes travelers 7 days a week. Hyatt House Atlanta/Downtown is a 7-story building with 150 upscale rooms 102 of which are spacious suites. The hotel is a block away to the Georgia Aquarium and ideally located near attractions such as the Centennial Olympic Park, CNN Center and The World of Coca-Cola. The Hyatt House was designed with features found in modern homes and apartments combined with architectural details offering a variety of guestroom types makes the hotel perfect for business and leisure travelers. During your stay, you will enjoy a complimentary hot breakfast and high-speed internet. The outdoor pool, fire place and fitness center will provide relaxation and a healthy lifestyle while away from home, and our knowledgeable Front Desk associates are available 24 hours a day to assist with your requests. In addition, the H BAR welcomes travelers 7 days a week. The Hyatt House lobby is brought to life with the H BAR, an integrated breakfast/bar island that features a complimentary breakfast including Omelettes Your Way in the morning. The Guest Market offers traditional and gourmet groceries for purchase and a personal shopper is available to stock kitchen with guests request. Cancel by 6pm EST 24 hours prior to arrival to avoid a 1 night room and tax penalty.